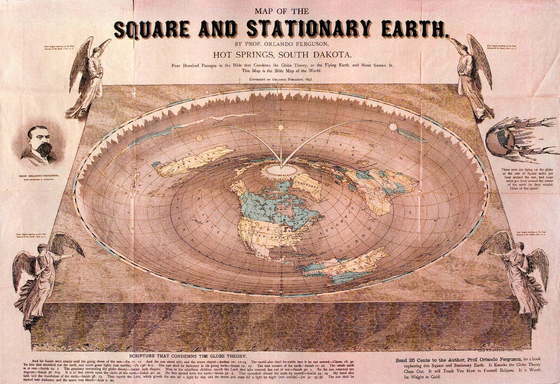 Don Homuth, a former North Dakota state senator and current resident of Salem, Oregon, will donate the sole complete copy of the Map of a Square and Stationary Earth by Orlando Ferguson to the Library of Congress. Homuth was given the map by his eighth-grade English teacher John Hildreth who had received it from his grandfather. He didn't realize it was the only one left intact until he contacted the LoC to arrange for the donation. He sits enthroned above the sphere of the earth and it's people are like grasshoppers." My new desktop image! This is awesome. Perhaps this should be the Astronomy Picture of the Day? Mark: The word means something like: "to encircle, encompass, describe a circle, draw round, make a circle" and is used for the "vault of the heavens". The more interesting word is "enthroned". The Hebrew word shows up in numerous places. In Is. 42:7 it refers to prisoners "them that sit in darkness ...". In Is. 6:1, OTOH, it refers to God as being seated on a throne. In Psalm 22:3 it is used even more metaphorically. 22 is the one that begins "My God, my God, why hast Thou forsaken me ..." Verse 3 is best translated as "thou art holy, enthroned on Israel's prayers." Isaiah is more poetry, than physics. The heavens are nothing more than a sphere of black paper perforated with pinholes letting a flashlight shine through as stars in a firmament. You all have been had! Al Gore and Gaia says so. It seems to imply that we could bombard Australia and Antarctica from the North Pole. Assuming they gave us a reason to.